It is well known that Abominable (Sn)O-men are illusive and retiring creatures, not prone to much socialising, but we always put our best feet forward when it comes to performance. There is always a sleuth of O-men surrounding the Abominable cake at events and our Annual Gathering of Members is regularly well attended. We attract members from all spheres of the community – families, individuals, elites and those trying orienteering for the first time. You may even be called upon to assist at an event before you have entered your first race! 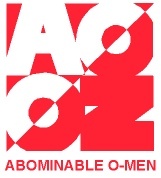 Once considered an elite only club when it was formed in 1990, Abominable O-men never really accepted this moniker, preferring instead to attract a select following of those who consider themselves a “bit out there”. This was emphasised by our “pyjama” suits on the early 1990’s which have now been replaced by more disguised attire whilst still displaying our aggressive nature. We have had our fair share of state, national and international representatives over the years as well as many state, national, regional and international champions. Our members travel extensively to compete interstate and overseas. Many senior members (read here “retired types”) travel annually to World Masters competitions and associated events as well as continuing to fund the more “junior” members in their overseas excursions. Abominable O-men can attest to being well represented at local events and have provided coaches, officials and administrators at the local and national level. We have a wonderful succession planning group with over 25% of our membership under 15 years of age. They contribute as much as they can to our Club organisation and event planning, as all small creatures should.